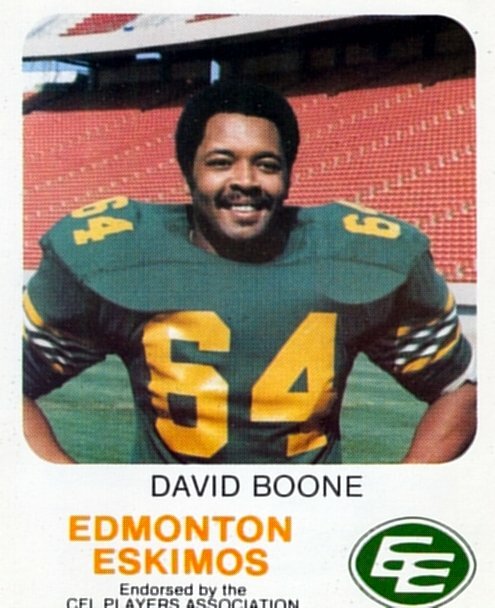 After playing his college ball at Eastern Michigan, David Boone came to the CFL in 1975 with the BC Lions. Boone stayed just the one year in BC and then spent one year (1976) in Hamilton before settling in with the Edmonton Eskimos as part of thei rgreat dynasty. Boone played seven seasons with the Esks (1977-83) and was a big part of thei rfive consecutive Grey Cup championships from 1978 to 1982. Boone won three West All-Star selections at defensive end (1977, 1979 and 1981) as well as one CFL All-Star (1981). Since quarterback sacks were first officially kept onl\'y in 1981, Boone's stats are very incomplete, but the big six foot four deensive end recorded 29 sacks in the four seasons for which there are records with a high of 14.5 in 1981. Boone also had 12 fumble recoveries during his career and one career interception in 1982 that he returneded 38 yards for a touchdown. * Some sources have incorrectly listed the date of death as March 26. Official quarterback sack stats were first kept in 1981. Official tackle stats were not kept until 1987.